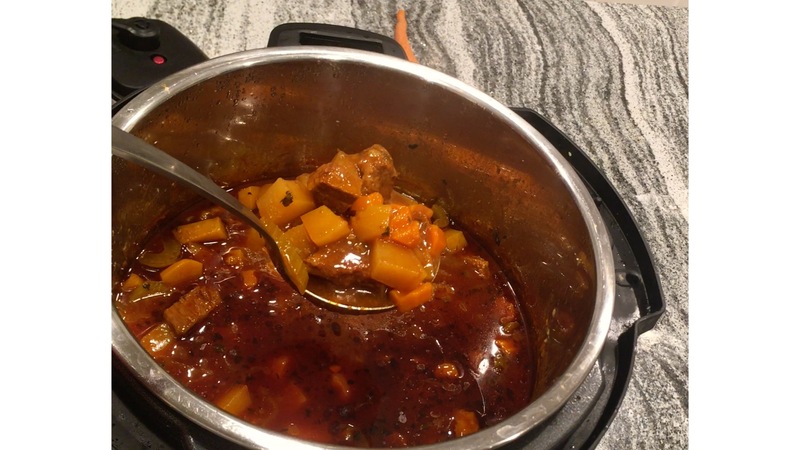 This version of Beef Stew originally started as a crockpot recipe. Through the years is has evolved to a recipe that I cook many different ways. It was first converted to the stove top when I forgot to set up the slow cooker one morning. 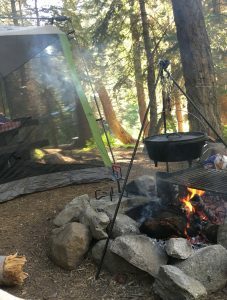 It worked so well, I used it on several of our camping trips in a cast iron dutch oven hanging with a tripod over an open fire. Most recently, I have converted this to cook in the IP. 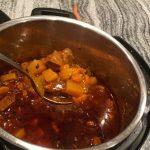 Using the Instant Pot saves a lot of time; and unlike the slow cooker, you can brown the beef and cook the stew in a single pot. This Beef Stew is one of the most amazing versions I have tried. 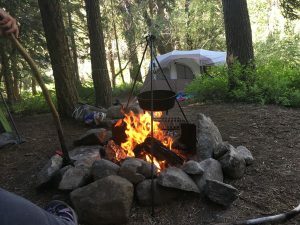 From crockpot, stovetop, Instant Pot, or over an open fire while camping, this quickly became a family favorite. Set IP to Sauté and wait until display reads HOT. While waiting, place flour in a plastic zip top bag (gallon size works well). Add meat, seal bag and shake well to coat meat with flour. Once the display reads Hot, add 1 T of the Vegetable oil, use a wooden spoon to coat the bottom of the pot with the oil. Add ½ of the meat and brown in the hot oil. Remove cooked pieces, set aside. Repeat with remaining meat and oil. Remove all the meat from the pot when done browning. If necessary, drain off fat. Add the vegetable juice to the IP and scrape any browned bits off the bottom of the pot. Add the browned meat, and remaining ingredients to the IP and stir to mix. Put on lid and set to seal. 35 minutes on soup/stew (manual should work too). 20 min NPR, then (I have also done a total NPR and saw no difference). I promise the vegetables do not disintegrate or turn to mush. Place flour in a plastic zip top bag (gallon size works well). Add meat, seal bag and shake well to coat meat with flour. In a large Skillet, brown meat, half at a time in hot vegetable oil. While the meat is browning, layer potatoes, onions, carrots and celery, bullion, garlic, basil and thyme. Top with the browned meat. Pour the vegetable juice over the meat. over and cook on low for 7-8 hours or high for 3.5-4.5 hours or until meat and vegetables are tender. Place flour in a plastic zip top bag (gallon size works well). Add meat, seal bag and shake well to coat meat with flour. In a Dutch oven, brown meat, half at a time in hot vegetable oil. When the meat is done, add the vegetable juice and scrape any browned bits off the bottom of the pot. Return the browned meat to the pot, and add the bouillon. Cover and cook at a low simmer for 30 minutes. Add potatoes, onions, carrots and celery, garlic, basil and thyme. Cover and cook on low 25 minutes or until the meat and vegetables are tender.